The Cougars got rolling in the first inning as their bats came alive to score three runs in the bottom of the first inning. With one out Bianca Morales (2-4, 2R, RBI, 2B) roped a double to center which scored Jazmin Alvarado (2-3, 2R, 3B), Maggie Carpenter (1-3, 2 RBI) followed with a base hit to center which allowed JJ Venzor (1-4, R, RBI, 2B) to score and a couple batters later Amanda Whipple (3-4, R, 2 RBI) lined to center to score Morales. Leading 3-0 in the bottom of the fourth inning the Cougars added another run when Whipple was able to drive in Morales to make it 4-0. Steele added a couple more runs in the bottom of the fourth inning as Venzor doubled to score Alvarado and Audrey Bagge (1-4, R) would score on a sacrifice fly by Carpenter to make it 6-0. They would go on to add more in the bottom of the fifth as Whipple, DJ Dumeng (1-1) and Elizabeth Bott (1-1, R) all singled to load the bases, Danelle Directo (RBI) is hit by a pitch which scored Whipple and with two outs Bott would score on a passed ball to make it 8-0. OLP over the final two innings would only garner two hits before Grace Richter shut them down. In the win, Richter went the full 7 innings for the complete game victory as she gave up 0 runs on 9 hits while walking 0 and striking out 3. Despite committing four errors on the day the Foothillers overcame that to put away the Storm as they had a field day at the plate and scored their runs in the middle innings. The Storm started off hot right away with a leadoff homerun by Danye Albritton over the left field fence to make it 1-0. They would score another run to push their lead to 2-0. Despite trailing the Foothillers didn’t fret as they got on a little roll in the bottom of the second inning as Jessica Medlin (2-3, R, RBI, 2 2B) doubled to score Candace Henderson (RUN) to pull within 2-1. 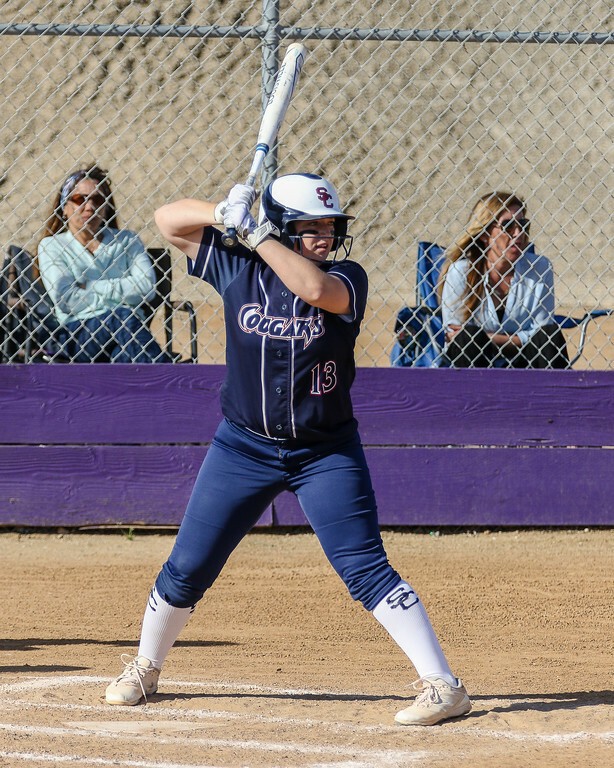 Grossmont would eventually tie the game in the bottom of the third when Kati Contreras (2-3, 2R, 2 RBI, 2B) lined a double to score Katie Appenzeller (1-4, R) and Kimmy Bond (RUN) advanced to third, she scored on a passed ball to give Grossmont the lead 3-2 and Contreras would advance to third base, Samaria Roope (2-4, 2 RBI, 2B) doubled which brought in Contreras and Aly Allmann (2-2, R, 5 RBI, GSHR) drove in Juliana Garcia (2-2, 2R) who came into run for Roope on a sacrifice fly to make it 5-2. Grossmont would add more to their run total in the bottom of the fourth inning as Contreras knocked in Medlin, a couple batters later Roope knocked in Garcia and Allmann would round out the scoring with a grand slam jack over the left field fence to score Contreras, Jordan Brown (1-3, R) and Giselle Thirakul (RUN) to make it 11-4. Taking the loss for the Storm was Chelsea Runyon who went 6 innings while giving up 11 runs of which 10 were earned on 12 hits while walking 3 and striking out 3. For the Foothillers, Roope tossed all 7 innings to get the complete game victory as she gave up 4 runs of which 3 were earned on 6 hits while walking 3 and striking out 10.